Cat Tales and Paper Trails: Technique Junkies October New Release Blog Hop! Technique Junkies October New Release Blog Hop! 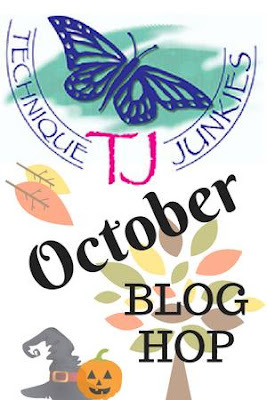 Welcome to the Technique Junkies October New Release Blog Hop! Hopefully you have arrived here from Giovana's blog! If not, and you'd like to start the hop at the beginning at the TJ Blog, please do! 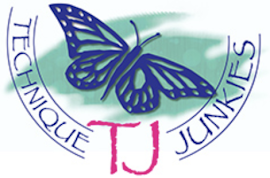 October brings the addition of 14 new fabulous stamps to the TJ website and all of these new stamps are 15% off through October 8th! 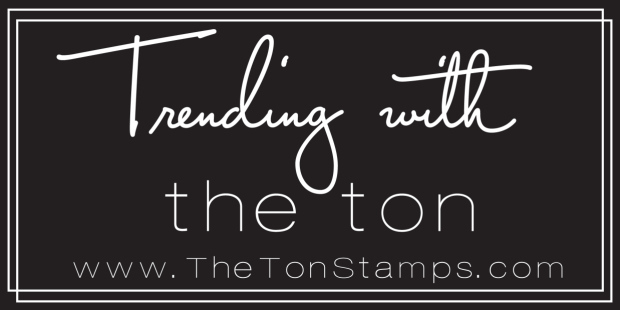 Today we are sharing a few projects made with these fun new stamps. 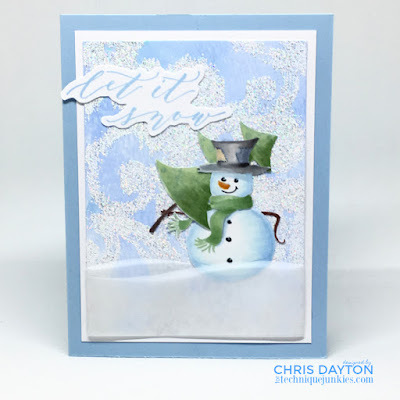 This Let It Snow card uses the Let it Snow stamps in a whole different way. My background panel was created by making a print with my Gel Press with white, blues and lavendar acrylic paints. When dry, I stamped the Arabesque background stamp using Versamark ink, then heat embossed with Diamond White embossing powder. I stamped the Let It Snow image on Hammermill 80# Digital Color Copy Digital Cover with Memento Summer Sky ink, then colored with Copic Markers. I then hand trimmed the elements out with scissors to create a new scene. I added hand trimmed vellum snowdrifts by wrapping around the base of my panel, and securing with tape on the back. It was then matted with a piece of layering weight white card stock and adhered to a sky blue card base. 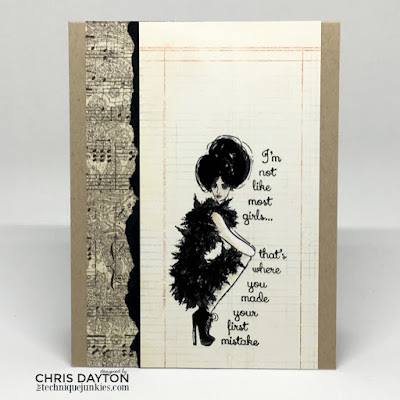 For this card, I used my Misti to stamp the Most Girls image on a piece of ledger print patterned paper. I left my stamp in place on the Misti, and used a little acrylic paint to paint in the skin tones, and cover the lines of the ledger print, I let the paint dry, then placed the panel back into my Misti and restamped in the exact spot twice to give a nice black image. I trimmed the panel and added strips of music paper and a torn sliver of black cardstock. 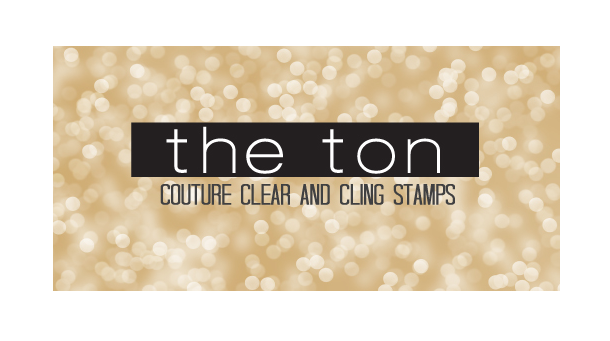 This clean and simple styled card was stamped on Hammermill 80# Digital Color Copy Digital Cover paper, using Morocco Memento ink. I used Copic markers to color, and added some shimmer to her mirrored compact with a Spectrum Noir Sparkle Pen. 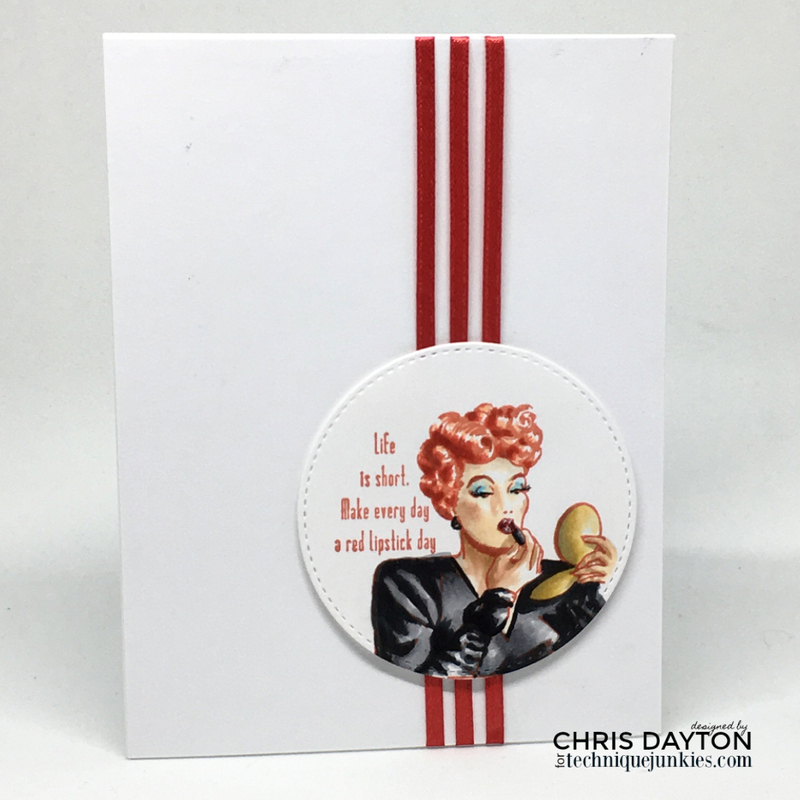 I.added three striped of 1/8' red satin ribbon to an sized A2 card panel, securing the ribbon strips with tape on the back before adding the panel to a white card base. 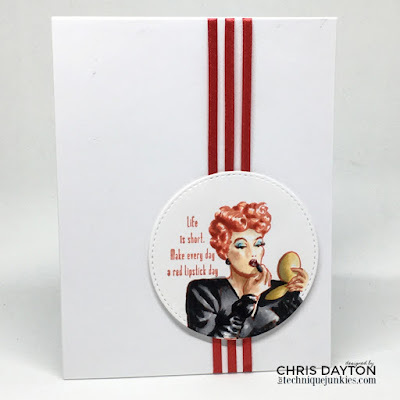 I used a stitched circle die to create the focal circle from my colored panel, and adhered it to the prepared card base using 3M dimensional foam tape. My final card again used the Arabesque background stamp. 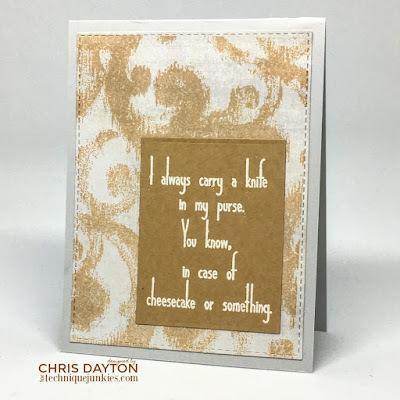 This time I stamped on a faux parchment look patterned paper using Gina K Honey Mustard ink. i trimmed the panel using a stitched rectangle die and added it to a pale gray card base. The Knife in My Purse sentiment was heat embossed on a coordinating piece of carestock using Wow! Vanilla embossing powder. That's all from me today, but there's still more to see in the hop! 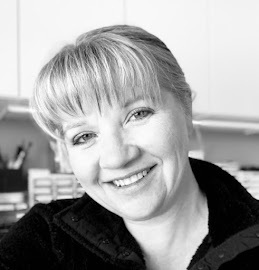 Your next stop should be Pat Huntoon! Have a wonderful day! Enjoy the hop! Cards cards are always so professional and polished Chris - not to mention the out of this world coloring skills. Really great set of cards. Happy Hop! Amazing..... I love the vellum snow drifts. And I think I need the most girls stamp. Awesome work. Your last card is coloured to perfection. Wonderful cards! The snow man is wonderful! The way you colored Red Lipstick Day is amazing! Great cards. Love that snowman. What rich, colorful cards. I appreciate the variety of techniques and materials used. Just the red ribbon under the "Lucy" image really made that image pop...so simple, but so eye-catching! All your cards are great ! !